For this year’s Burns Night, Auchentoshan, Scotland’s only triple distilled Single Malt whisky, has launched a series of alternative Burns Suppers at bars and restaurants across the UK, entitled ‘Auchentoshan Presents… The William McGonagall Burns Supper’. Instead of honouring Robert Burns – Scotland’s answer to Shakespeare – as tradition dictates, the suppers celebrate Burns’s arch enemy and the renegade poet, William McGonagall and his flair for challenging perceptions of poetry. Auchentoshan is the only Single Malt Scotch whisky that triple distills every drop (rather than just once or twice), thus creating a whisky of unmistakable smoothness. Just as Auchentoshan likes to do things differently, so did McGonagall; whilst Burns was a traditionalist, McGonagall was a rebel. With his outlandish performances, William McGonagall turned Scottish poetry on its head, and a McGonagall Supper does just that – the pudding is served first, followed by the main course, finishing with the starter. Auchentoshan has provided on-trade accounts with specially designed tools to host their own McGonagall Burns supper, including recipes, posters, menu cards, tent cards, coasters and event tickets. As each dish is paired with an Auchentoshan expression, served in specially created, humourous Auchentoshan whisky glasses, each featuring a design of one of a variety of different shaped and sized moustaches. Consumers can also host their own ‘Auchentoshan Presents… The William McGonagall Burns Supper’ at home by downloading a ‘How To’ guide and decoration materials from the Auchentoshan website, which include invitations, menu holders, andexamples of McGonagall’s poetry. 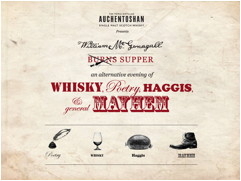 For listings and details of ‘Auchentoshan Presents…The William McGonagall Burns Supper’ held in the UK, please visit www.Auchentoshan.com. New venues will be added daily.